Robinson Cano received brutal criticism the past winter — ex-coach Andy Van Slyke called him the worst player he’d ever seen — and has rebounded in near-record fashion. Had it not been for newcomer Ichiro Suzuki, who led the American League in batting (.356) and stolen bases (56), and won Gold Glove, Silver Slugger, Most Valuable Player and Rookie of the Year awards, Bret Boone would have been the undisputed sensation of the 116-win Mariners in 2001, the last edition of the club to reach the postseason. Boone that year became the first AL second baseman in the modern era (since 1900) to hit .300 or better (.331) with 30-plus (37) home runs. He took home a Silver Slugger and finished third in the MVP vote. Boone also led the AL in RBIs with 141, becoming the third player in franchise history, following Ken Griffey Jr. (147 in 1997) and Edgar Martinez (145 in 2000) to top that category. Since Boone’s historic 2001, no second baseman in either league has come close to his 141 RBIs. In fact, only Rogers Hornsby since 1900 – 152 in 1922, 149 in 1920 and 143 in 1925 – ever had more in a season. Now, Robinson Cano not only has a chance to eclipse Boone’s modern record, he even has a shot at making a run at Hornsby, a Hall of Famer who managed the Seattle Rainiers in 1951. 1. Boone’s 141 in 2001; 2. Jeff Kent, 128, 1998; 3. Kent, 125, 2000; T4. Joe Gordon, 124, 1948 and Jackie Robinson, 1949; 6. Kent, 121, 1997; 7. Roberto Alomar, 120, 1999; 8. Bobby Doerr, 120, 1950; 9. Cano, 118, 2011; 10. Boone, 117, 2003. Cano’s 36 RBIs not only lead the AL, they lead the majors. He also leads MLB in road home runs, RBIs, extra-base hits and slugging percentage, and is second in OPS. Cano had a season-high six RBIs April 26 against Houston and five against Texas April 6. He has delivered seven go-ahead hits, and two game-winners. With eight multiple-RBI games, Cano has failed to drive in a run in only six of Seattle’s 40 contests. At 33, the six-time All-Star is putting up the best offensive numbers of his career, which must come as a jolt to Andy Van Slyke, the former Mariners coach who was part of the bath water thrown out last winter when new GM Jerry Dipoto ousted manager Lloyd McClendon. 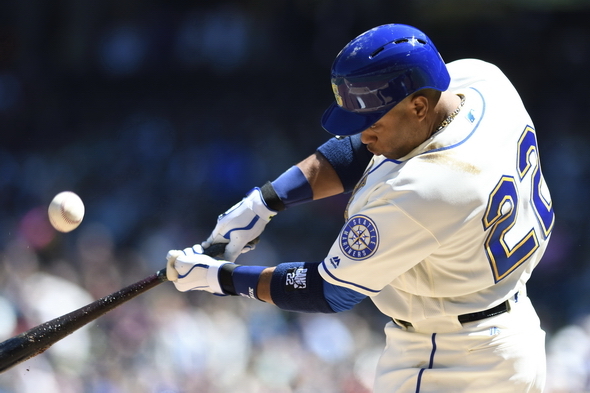 In the first half of 2015, Cano, battling a stomach ailment, hit .251/.290/.370. But in the second half, hampered by a double hernia, Cano rebounded with an eye-popping .331/.387/.540. That didn’t deter Van Slyke from delivering a major gum flap in December. Cano underwent surgery for the first time in his career following the season and now here he is, threatening, at least through one quarter of the season, a record set by Hornsby 94 years ago. Van Slyke has yet to be heard from on Cano’s rebound and the significant impact it has had on the Mariners. Robinson Cano isn’t the entire turnaround, but he’s the headline. For some reason Steve left out Boone’s ROID use as the reason for the huge season. As a result, Boone’s numbers are bogus and an embarrassment to the organization. He had 3 big season’s (all in a row) in 14 seasons. He’s a phony. The backend of the height of the steroid era my friend. That was baseball in the 90’s & early to mid 2000’s. There’s * all over the record books, or there should be. Please provide your confirmed list of perps besides those publicly admitted or wer econvicted. Eager to see your proof. Art – Google “bret boone steroids – There are an endless number of PAGES concerning Boone and steroids. They all point out his weak numbers through age 31, the year before he was traded to the Mariners, then at 32 had possibly the BEST offensive season at 2B in the history of the league – he showed up 20 lbs heavier than the year before and was physically ripped. His BA went from .251 to .331 and HR’s from 19 to 37, in one year. He had 3 top offensive seasons, then the league announced it would test for steroids the next year (2004) and, whoa, just like magic, his numbers plummeted, back to his pre-Mariners numbers. BA: From .295 to .251. Did Boone ever admit it? No. MLB did not test til 2004, so he didn’t fail a test in his Mariners years. So no, there is no hard proof, yet no one disputes his steroid period. Here is one of the many hundreds of articles on Boone’s suspected roid use, followed by his lifetime stats, which carried a .266 BA. Your articles only show a decline in statistics. If that’s your basis then every player in the history of MLB was a steroid user. As you said — suspected. I’m not saying I believe Boone, but I can’t know. Neither can Bleacher Report nor other media outlets, nor the writers voting for HOF. Boone says in his new biography “Home Court” that he never took steroids because he was afraid of getting caught, He also was drinking heavily his final year with the M’s, had bad knees and retired at thirty six. He eventually went through alcohol rehab at a facility and dried out. I’m as skeptical as anyone about the steroid era. But I’m fairly certain that lots of relief pitchers that no one suspected were PED users because the drugs improved endurance and durability. They never looked ripped like Boone, but would have had they been a fitness freak as he was at his peak. Denial is not a river in Africa………. C’mon guy, cough up Van Slyke’s e-mail address. We have issues to discuss. At least you’re on point with the column about Cano. While not joing the steroid argument, I’ve often wondered why the abrupt fall off of Brett Boone. “my room mate Lori Is getting paid on the internet $98/hr”…..!kj490ytwo days ago grey MacLaren. P1 I bought after earning 18,512 Dollars..it was my previous month’s payout..just a little over.17k Dollars Last month..3-5 hours job a day…with weekly payouts..it’s realy the simplest. job I have ever Do.. I Joined This 7 months. ago. and now making over hourly. 87 Dollars…Learn. More right Here !kj490y:➽:➽:.➽.➽.➽.➽ http://GlobalSuperJobsReportsEmploymentsClearlyGetPay-Hour$98…. .★★★★★★★★★★★★★★★★★★★★★★★★★★★★★★★★★★★★★★★★★★★★★★★★★★★★::::::!kj490y….,…. He addressed that in several interviews over the years. After his amazing year he had a bad drinking problem on par with Vin Baker’s. Not long after he just lost his passion for baseball. Looking at his career stats his decline IMO is remarkably similar to Baker’s. J is right. Boone has owned up to his alcohol problem. I’d hope we could avoid speculation and innuendo usually reserved for politics. Without proof I choose to accept Boone’s success for what we know it is, not the negative conclusions some prefer. We have accept the 2001 series loss to the Yanks the same year with some Yankee players admitting and apologizing for steroid use. Try and get a Yankee fan to apologize for that! Same thing, Boonies season is what it is.